STRONG SUPPORT AT 14174-14016 - 26/06/2009. STOCKS TO WATCH OUT FOR IN THE COMING WEEK. Market started the week with a black candle on the Sensex as well as Nifty. It was due to the selling pressure which was a result of Bearish Evening Star pattern observed over the past week. On Tuesday the market took support at the Trendline and started some sort of comeback. On all the three days i.e. Wednesday, Thursday and Friday the market took support at Trendline before decisively bouncing back strongly on Friday. Friday’s candle assumes great significance, as it formed a White Marubuzo and saw the market move up consistently throughout the day. The market seems to be in no mood to give up the bullish momentum before the budget. Thus as a result the market has formed some sort of a higher bottom against the previous lower bottom. Sensex has made a higher bottom at 14016 with respect to the previous lower bottom of 13518. Similarly, Nifty has formed a higher bottom at 4143 with respect to the previous lower bottom of 4092.Thus, for any further upmove to sustain, support at Sensex-14016 and Nifty-4143 should not be breached. 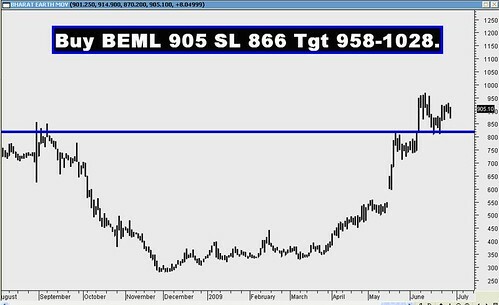 Ø Stocks such as BeML, Texmaco, Stone India. Ø Infrastructure stocks are likely to be benefited. Stocks like IVRCL Infra, HCC.Ø Fertilizer stocks like Chambal Fertilizer and Nagarjuna Fertilizer will get strong boost. Ø Oil Marketing Companies like HPCL, BPCL, and IOC.Ø SCI, BHEL are too under the Disinvestment scanner. Ø Stocks like IFCI have started the process of negotiation of stake sale once again. This is likely to keep the stock in focus. Ø ABG Shipyard and Bharti Shipyard are under a bidding war for a stake in Great Offshore. With the entry of Videocon Industries in the bidding for Great Offshore, it is likely that the prices of Great Offshore will increase and this will benefit the share holders. Sensex opened the week at 14591, made a high of 14781, made a low of 14016, and closed at 14764, thus registering a weekly gain of 243 points. Sensex has made a strong comeback on Friday and went from strength to strength making a White a Marubuzo in the daily charts. It is a strong bullish formation. This formation made the weekly chart also positive by forming a Hammer with the White body which is a Bullish Reversal pattern. The Sensex went down due to selling pressure and flirted with the 100 Week M.A. (14250), but somehow managed to close above it. Thus the 100 Week M.A. is providing strong support to Sensex.A strong demand Trendline from the low of 8047 to a low of 11695 is providing strong support to this entire rally. This Trendline was tested 4 times this week and it provided strong support. It can be seen below in the chart. Thus the support of this Trendline 14174 must not be breached for upmove to continue. The Sensex has made a higher bottom at 14016 as compared to the previous bottom of 13518. Thus 14016 must not be breached in case of any correction.For the next week Sensex will have immediate pattern wise target of 15320. For the week ahead the Resistance is at 14930-15332-15600-16457. Support is at 14526-14179-14016-13518. Nifty opened the week at 4314, made a high of 4383, low of 4143, and closed at 4375. Thus the weekly gain was 62 points. Nifty has made a strong comeback on Friday and went from strength to strength making a White a Marubuzo in the daily charts. It is a strong bullish formation. 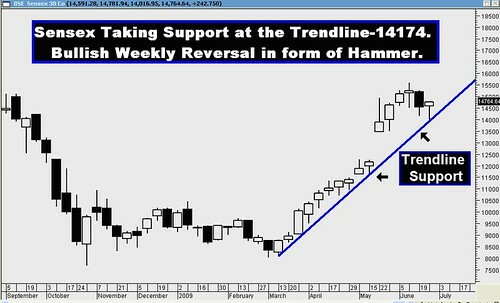 This formation made the weekly chart also positive by forming a Hammer with the White body which is a Bullish Reversal pattern. The Nifty went down due to selling pressure and flirted with the 100 Week M.A. (4270), but somehow managed to close above it. Thus the 100 Week M.A. is providing strong support to Nifty. A strong demand Trendline from the low of 2539 to a low of 3537 is providing strong support to this entire rally. This Trendline was tested 4 times this week and it provided strong support. It can be seen below in the chart. Thus the support of this Trendline 4320 must not be breached for upmove to continue. The Nifty has made a higher bottom at 4143 as compared to the previous bottom of 4092. Thus 4143 must not be breached in case of any correction. For the next week Nifty will have immediate pattern wise target of 4561. For the month of July good amount of PUT writing is seen at 4200 strike which will provide strong support. Strong CALL writing is visible at 4700 strike. Thus it will be resistance as the rally moves forward. For the week ahead, the Resistance is at 4448-4558-4679-4803. Support is at 4320-4206-4143-4092. Once again we hit bull’s eye as all our recommendations managed to reach their targets easily. A whopping profit Rs.3,30,612 in just a weeks time. 1. Construct a Bull Call Spread for SBI (1749) is likely to reach 1800-1843.Buy 1740 Call at 110 and Sell 1800 Call at 88.Cost of constructing the Spread is Rs. 22 (Rs. 2,904) which can be the max loss and the max profit will be Rs.38 (Rs.5,016). 2. 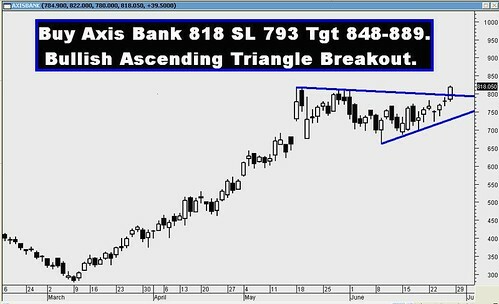 Construct a Bull Call Spread for Infosys (1827) is likely to reach 1878. Buy 1800 Call at 105 and Sell 1890 Call at 65. 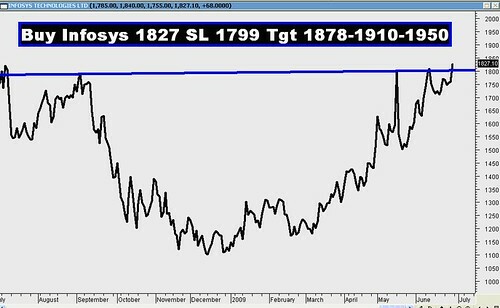 Cost of constructing the Spread is Rs. 40 (Rs. 8,000) which can be the max loss and the max profit will be Rs.50 (Rs.10,000).